Powers/Abilities: The Kestorans are about 9' tall and possess a stocky frame, presumably granting them superhuman (enhanced human) strength and possibly increased durability. 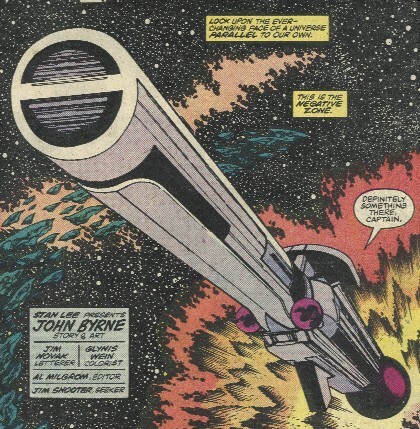 They have access to advanced technology, including their starship, Kestor's Hope, and Electro-Lances. Traits: The Kestorans are mostly peaceful, but are somewhat xenophobic, agoraphobic, and pretty much uncomfortable around anything not inherent to their ship, Kestor's Hope. Though they have access to advanced technology, they do not truly understand it and proved unable to come up with the means to repair a damaged navigational system for over 10, 000 years. Their religion is unknown, but they do worship an "Almighty Spirit," whom they believe to have created all Kestorans complete and unchanging. The idea of evolution is foreign to them, even when confronted by its truth. When startled, the Captain exclaimed "Trantor's Bones!" Presumably making Trantor either a famous Kestoran, or a deity worshipped by the Kestorans. Due to the terrible secret passed down from generation to generation to a single Kestoran, they are almost certain to continue wandering the stars, seeming to search for a home, but never finding one. (Fantastic Four I#253 (fb)) - For a million generations, the Kestorans thrived upon Kestor. They had built a great technology and a great culture of art and faith. They lived in total harmony with their world until the day, 10, 000 years ago when their planet revolted against them. After their scientists learned that Kestor was doomed, the High Priestess decided that 20,000 of them could leave Kestor to seek another world. Their faith allowed the Kestorans to calmly draw lots--selected by the infallible computers of the priest-scientists--choosing the survivors. Within a week, they boarded their great ark and left Kestor. However, as the entire group entered cryogenic suspension and traveled away from Kestor, its sun went nova. The ship was distant enough that it was not destroyed, but it was severely damaged. The navigational core of their computer system was severely hit, and the programmed data on their intended destination was lost to them forever. The Great Lie: "Acting on emergency programs, the main computers sought a solution to their dilemma of the destruction of their navigational computers. Scanning their personality files, the computer dipped into the cryogenic capsules in which all 20,000 Kestorans waited in stasis. Five hundred of them were selected to now act as the crew of Kestor's Hope, guiding her through the void"
Five hundred who would never see the face of their promised world. The crew proved unable to find a new planet, and as they searched the stars, generations passed, handing down their quest to their successors. Meanwhile, the creator of the Great Lie passed down the truth about the Kestorans to her descendents. (Fantastic Four I#253) - The Kestorans encountered the Fantastic Four. After a few crew members unwittingly attacked them, the Captain stopped them and explained their quest to their guests over dinner. 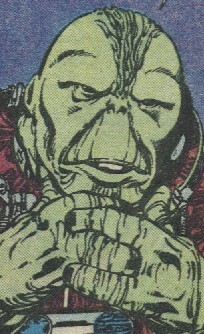 Reed's knowledge and powers enabled him to access and repair the navigational computers, and soon after, Kestor's Hope landed on a planet that perfectly matched the qualities of Kestor. However, after 10, 000 years aboard the Kestor's Hope, the Kestorans were mortified to see their new home. Believing the computers and Reed to have failed them, the Captain ordered the departure from "New Kestor." Reed realized that the Kestorans had evolved to life aboard their ship, but the Captain refused to believe this. Thinking the Four to be demons, the Captain prepared to have them all blasted out of an airlock, despite the presence of several other Kestorans with them. Believing the life of any Kestoran to be too precious to waste, the crew's Number One revealed the secret of the Great Lie to him. Unable to stand the truth revealed to him, the Captain died. 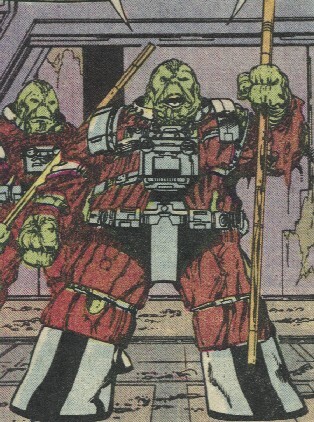 The multi-great grandson of the first Captain of the Kestor's Hope, he was unable to stand the thought of living on their target planet, and nearly slew several crew members in his desire to kill the Fantastic Four, whom he saw as demons. When his lover, Number One, revealed the Great Lie to him, his heart and mind could not stand it, and he died. She designed the plan for 20, 000 Kestorans to survive the destruction of Kestor by fleeing aboard the Kestor's Hope. 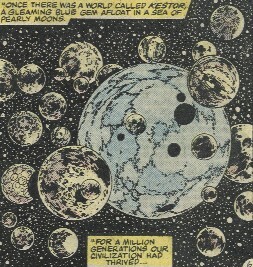 "A gleaming blue gem afloat a sea of pearly moons," it had been the home to the Kestorans for a million generations. Ten thousand years ago, however, the hurtling moons began to shift in their orbits, causing a devastating tidal effect that began to destroy the planet. While a contingent of natives escaped the planet, the cause of the moons' wandering became apparent as the sun exploded into a super-nova. Spanning 1/2 mile in length, the ship housed 20, 000 Kestorans. It contained an immense cryogenic station able to hold all 20, 000, but it was damaged in the explosion of their sun, and all but 500 were killed; that 500 became its crew. The ship's navigational computers were rendered inoperative, leading the crew to search fruitlessly for 10,000 years. 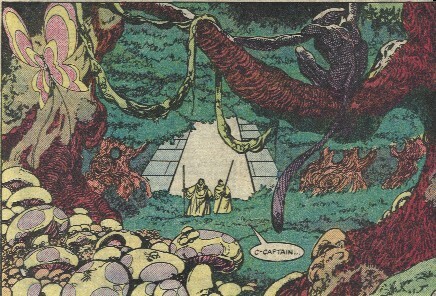 After Reed repaired the navigational computers, the Kestorans proved unconsciously unable to cope with the idea of life off the Kestor's Hope, and so they returned to their unending quest. A world picked to be an exact match for Kestor, it proved absolutely abominable to the crew who had evolved to life on the Kestor's Hope after 10,000 years aboard it. The planet was judged unsuitable and left behind. It was a world of lush flora. The descendent of the Kestoran who created the Great Lie, she was the lover of the Captain, and preserved the Great Lie amongst the crew. She hoped that finding their promised world would set the Captain and the crew free, but she was forced to admit that they had evolved and could no longer stomach the thought of a planet similar to their original home. She continued the Great Lie and the pointless quest after the Captain died from learning the truth.